This friday another special night will take place. 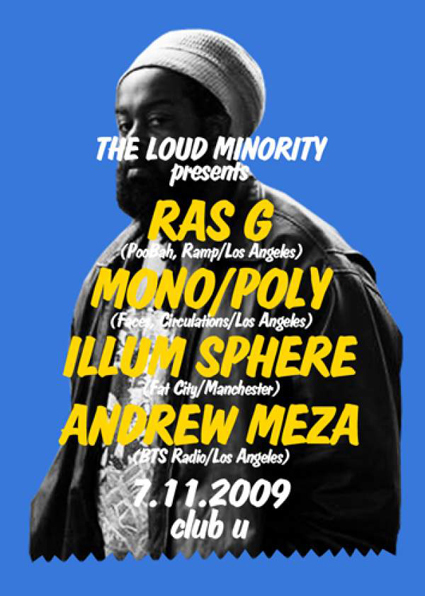 With Ras G, the ultimate Hip Hop rooted son of Sun Ra, one of the most psychedelic beat constructors of the contemporary Los Angeles music scene plays a rare European gig. 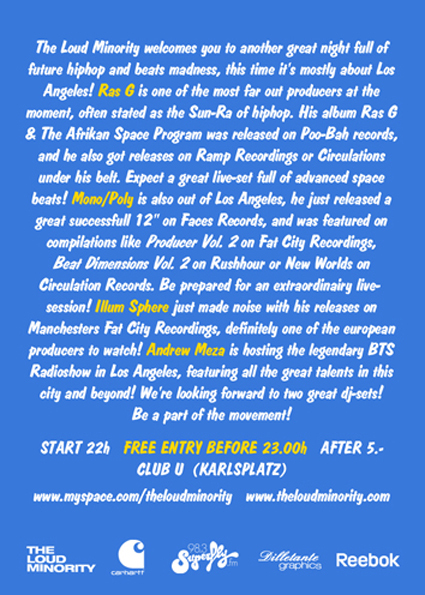 Beside him the fusion Hip Hop act Mono/Poly and DJ Andrew Meza, initiator of the underground broadcasting station BTS Radio, travel over the Atlantic Ocean, to share the freshest L.A. sounds with the European folks. Furthermore illum Sphere from Manchester is part of the line up, to demonstrate that 20 years of Warp Records left some marks in the world of DJs and producers from United Kingdom. So be ready for some ambitiously innovative music, that see further than the end of one’s nose.